With the implementation of the 2017 Wide Body EBA – it’s time to revise the spreadsheet I developed to track and check Overtime, Callout, etc for the 2011 EBA. Part and parcel has been seeking clarification from the AIC/CP on certain aspects of the EBA’s implementation. Most particularly clarification over the MCG, how RP changeovers are going to be implemented and how they impact the credit hours associated with Duty Periods and Flight Duty Sequences (MCG) that take place over the RP changeover to the next RP. I believe I have the answers now, the spreadsheet is in beta; welcome to the test program! Note : Some the images here may look a little small – but if you click on them they expand to a decent size over the text. Note : The Allowance Calculator requires Visual Basic. This means it does not run properly on MAC or IOS (iPad). You can use your Mac/iPad to enter the list of duties, but the Payslips tab requires a custom function I wrote to work. You can use the Excel in Citrix, or if you have a PC you can get Office Pro as a Virgin Employee quite cheaply – ask me how. 19Mar19 : The RP 2018 13/01 issue keeps on giving – small correction to the naming of B777 RP’s through 2019. Download HERE. 27Nov18 : RP13/01 has just been published with RP01/2019 starting on 31Dec18. Fowl Ball! How can you start an RP on the 31st of the year before? It should have been RP1314. I think they did it just to annoy me. Anyway – manual fix required in this version to accurately reflect RP1301/2018 (and RP0203/2019, etc). 18-Oct-2018 : Updated for ATO Domestic and International Allowance Changes. 21-Mar-2018 : Whoops – previous upload had my roster in it! 26-Jan-2018 : Found some bugs in the new A330 sheet. Basically it wasn’t calculating Carry-Out Flight Pairings correctyly. 22-Jan-2018 : Updated 2 Operating sectors for the A330. Tidies up the conditional formatting in cells to more appropriately highlight cells that should have data (Green) and cells that really should have data (Yellow). Also Combined Position/Operating route into a single cell eg: “MEL-BNE” – note this means that the instructions below aren’t quite matching the spreadsheet for the moment. 20-Jan-2018 : Update for the A330. There’s now an A330 tab in the sheet. Please advise if it’s working ok! The following video covers Entering Your Roster. This next one covers Carry Out Flight Pairings (including MCG) and Carry-In Flight Pairings. Finally – the A330 Differences in the sheet. Late addition – Entering Duty Periods and Checking Payslips for Domestic and International Allowances. Note : While the sheet does both the A330 and the B777 (on the 2017 Wide Body EBA) only the 777 is described here. At the moment the A330 sheet only handles one sector per day but I will fix that shortly. Other than that – the instructions are valid across both fleets (I hope). Ranks : It does Captains, First Officers, and Second Officers. The 2017 EBA has levelled the playing field in terms of Checkers/Trainers and OT and Callout, so there’s no longer the need to differentiate. Levels : Whether you’re Level 5 or Level 1 – you select and the sheet does the rest. Level Changes : On 01 July each year, your Pay Level increments. Therefore the Overtime/Callout rates increase also. The sheet copes with this. A330 Odd/Even SN : The A330 has a different number of min days off each RP, depending on whether you are an odd or even staff number. Seriously? Anyway I’ve added this to the A330 sheet so the min DDO’s calculates correctly. 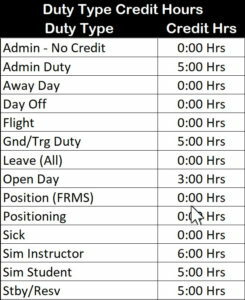 Duty Select : You don’t have to know credit hours – just select the duty for each duty day and the sheet will use the relevant EBA Credit Hours. Leave : Leave impacts the Overtime Threshold, as well as the minimum number of days off required in the month – the sheet copes with this. 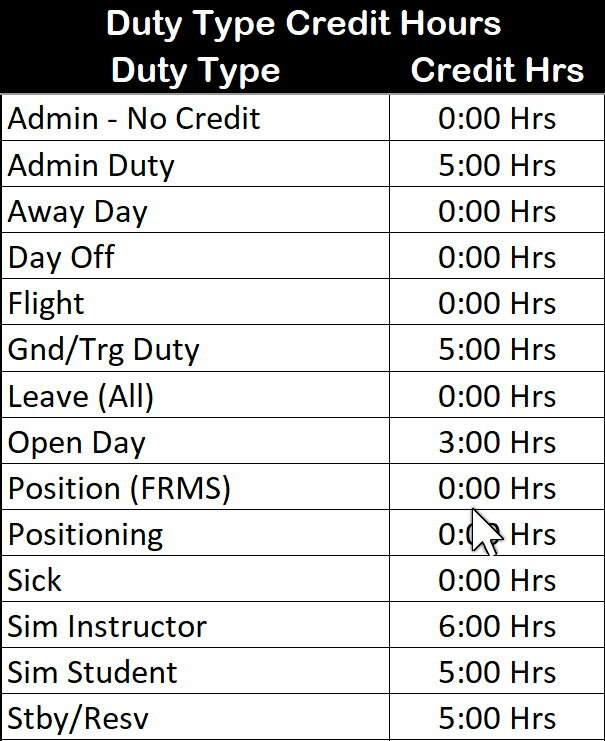 Positioning : Positioning changes a bit, with the introduction of a 1 hour sector minimum, 50% basis for credit hours and 2 hour minimum for position only duty periods. As always the maximum of Scheduled vs Actual is the basis for calculation so you’ll need to track and enter both. I’ve also added the ability to Position (FRMS) after going fatigued so the credit hours won’t count. Ad Hoc Training : When you’re not a Check/Training Captain, but conducting Ad Hoc Training as an Instructor (eg : NTS) – there’s a credit and payment. The sheet tracks this as well. Data Filtering / Validation : As much as possible, cell entries are checked from lists for validity (Duties, Airports, Yes/No’s, etc). Any time this is done – there’s a list box you can click to drop and choose from. MCG : The Minimum Credit Guarantee of 5 hours for each day of a sequence of Duty Periods that takes you away from Home Base and includes an operating crew Flight Duty Period (FDP). This was a little tricky to implement, and I’m not sold on my method – suggestions welcome! Carry-Out DPs/FDPs (including MCG) : Any series of duties (must include an FDP) that carries into the following RP are credited as a whole into the could well result in an MCG based additional payment in the originating RP. Therefore in order to track and calculate this, you’ll need to enter all the Duty Periods past the end of the current RP at the bottom of the sheet in order to ensure the DP/FDP credit values are added and the any applicable MCG calculation is checked. Comments : So you can stir the memory every 8 weeks without having to come back here, many of the cells include comments to remind you how to fill them in or the function they perform. These comments are indicated by the small red rectangle, and pointing your mouse at them causes them to popup. Cell Color : Cells are color coded to assist in entry. Generally only cells coloured GREEN are where you should (can) enter data. Sometimes a cell will be coloured YELLOW to indicate that either no entry has been made (and one is required); or to highlight the use of that cell to you (such as to override a calculated value). In the example show, because Positioning has been selected, the Sector field is yellow indicating an entry required, and the Scheduled and Actual Block Times fields are green, also awaiting entry. Note the EBA Credit field is white and is a calculated field you cannot enter data into. Meanwhile, the Over Ride field is also green in case you want to over ride the calculation. Similarly, on the Flight line, the From, To, Scheduled and Actual Block fields are yellow, awaiting the details of your flight duty. Error Checking : There is a comprehensive cross check built into the sheet to try and ensure you have completed it correctly. If an error is detected (such as a day you forgot to fill in) the “Error” box in the top LH Corner of the sheet. Further, there will be an error flag at the end of the row that contains the error. Finally, the cell in error (might) also be red/yellow to indicate a problem. Choose your Rank (Capt, FO, SO). This influences rates for Callout, Overtime, etc. A330 Only : You need to select whether you are an Odd or Even Staff Number (SN). This impacts the calculation of your Min Days Off for the RP. Having made these basic suggestions, the Overtime Threshold, Effective Overtime Rate (paid after the RP completes) and the Callout Rate are displayed. Note that the OT/Callout rates are based on your Pay Level/Year selection, and the OT Threshold includes the vLearn credit in each RP. The Error flag is shown because the selections against the days of the RP are not yet complete. So the main sheet is where all the work happens, of course. You must select a duty type for every day in the RP – even days where you didn’t do anything, or days that don’t exist (such as the one between takeoff and landing on the way back from LA). Select the cell, then click the little drop-down arrow to see the list. You can also just type in the entry you want (you must spell it correctly!). Note that having selected it once, the next time you can just start typing the entry, and Autofill will quickly work out what you are after. This seems to be the best way. Strictly speaking, the days in the column on the LHS of the sheet are based on Crew Member Base Local Time. So when you assign a duty or flight down route in LAX – you should be selecting the Australian Date for this duty. In practice, this only comes into play for carry-out flights/duties at the end of the RP – and this area has been tidied up immensely since EBA 2011. Shown here is the current list of duty types in use. These may change from time to time, but so far these have worked from the previous EBA. Away Day : Basically days away down route that are not days off. Also the day between departing LAX and arriving back into Australia. Day Off : This is your DDO’s and ADO’a. Note that sometime Crew Control will convert a duty to a Blank day as the result of a change. This is basically a Day Off that won’t generate a callout if you subsequently work it. Flight : Select for any Flight Duty Period (FDP). Gnd/Trg Duty : Basically any type of Ground or Training Duty that’s not Admin – SEP, NTS, etc. This includes running such courses. Leave (All) : All types of leave that reduce your OT threshold, including Annual, Parental, Carers, etc. Open Day : This is the 12 hour notice, 3 hour credit standby day that came in with the 777 2011 EBA. Love these. Positioning : Any form of positioning, where the positioning is the only duty undertaken that day. The sheet automatically handles the 50%, minimum 1 hour per sector; minimum 2 hours for position only duty days. Position (FRMS) : Positioning in the event of going fatigued may not attract credit. Check the EBA whether this applies to your positioning after going fatigued and if so, select this duty to calculate your credit hours correctly without the credit for FRMS Positioning. Sick : Sick days do not attract credit and do not reduce your credit target. Sim Instructor / Sim Student : These two duties have different credit values. Standby/Reserve : This is applicable to both Standby at home and Hotel Standby. 3. The Simple Duties – as well as Callout, Ad Hoc Training and Cancelled Accommodation. So some of the duties (Flight, Positioning) are clearly more complex than others. Let’s get the simple ones done first. Callout : If a callout is applicable, you need to Enter or Select Yes in the callout column. Note there is no longer Day One, DayOne+ callout rate – it’s all one rate. 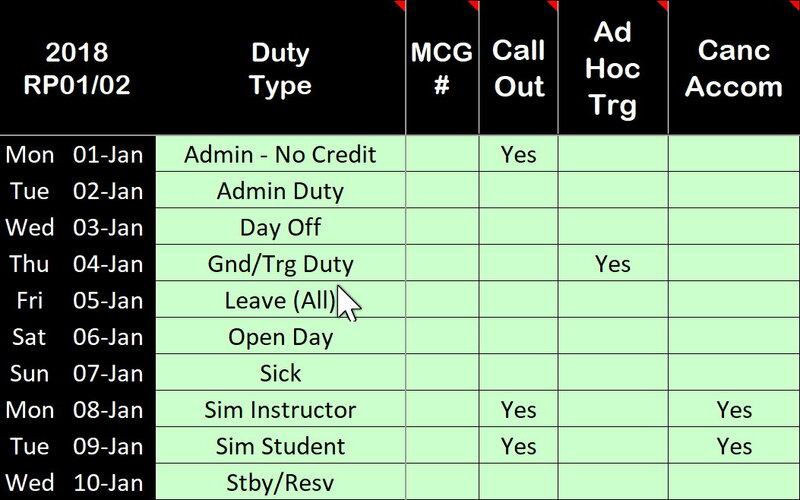 Ad Hoc Trg : If you’re performing a Gnd/Trg Duty as an Ad Hoc Instructor – enter Yes in this column to have the sheet calculate your Ad Hoc Instructors payment to the breakdown/total. Canc Accom : If you have cancelled company accommodation for one or more duties, select Yes here to have the sheet include these in the breakdown/total. Positioning typically gains a 50% credit of the larger value of (Scheduled or Actual Block Time). Once again – prior to positioning the Flt Time value on your roster is the Scheduled Block Time; once you’re positioned your roster will show the Actual Block Time. There’s a minimum 1 hour credit per sector (applied after the 50% factor). If the only thing you are doing in the duty period is Positioning – then there’s a minimum 2 hour credit. Remember that if you commence a Duty Period with Positioning (or anything else) that goes over midnight Crew Base Local Time of the last day of the RP and into the next RP – the credit (Scheduled/Actual/EBA) goes into the RP in which the Duty Period commenced. There are some very specific instance where International Positioning in Economy comes with 100% of the (Scheduled/Actual) hours as Credit. In this case – the EBA Override cell is used to credit yourself with the full sector’s credit. Here you can see a typical series of duties. Day One is positioning up to BNE for Simulator. Day Two is the Sim Session, and (yet to be entered) the positioning sector home. Note the Yellow cell showing a required entry (the sector) and the three green cells for Sched Block, Actual Block, and Over Ride. The EBA Credit is already filled in at 2 hours minimum since that’s all you are doing during the duty period. Now the first line is basically complete. The sector (MEL-BNE) has been entered. The Sched Block (from roster publication) has been entered. The Actual Block (from the roster after “flown”) has also been entered. Since 50% of both these values is less than 2 hours – the EBA Credit remains at 2 hours. Note that any value you enter in the Over Ride cell will over-ride the EBA Credit cell. Any value you enter in this cell turns the cell Orange to indicate that an over-ride is in use. But we have to get home from BNE after sim. This positioning is part of the Duty Period applicable to the Sim Student duty. To apply this, click on the Sector cell and enter the BNE-MEL sector (even though the cell is not green). Once you’ve done this, the Sched Block, Actual Block, EBA Credit and Over Ride cells will activate for further entry. You can see that in this case the 50% credit value is calculated (since there is no 2 hour minimum) and that Actual is great than Scheduled. If this was SYD-MEL, the EBA Credit value would show 1:00 since 50% of SYD-MEL is less than the one hour per sector EBA minimum. Finally – in the event that we go fatigued after a duty and are not safe to drive home, any positioning sector that follows the rest may not incur a credit value. In this case, show the duty as Position (FRMS) and whatever you choose to enter in the Sector, Sched Block, Actual Block cells – the EBA Credit cell will show 00:00. Note however that the Over Ride cell still functions to override all calculation and uses the entered Over Ride value to credit your hours. One case the Over Ride cell could be used is when positioning internationally on a sector length above 7 hours where the rest period after the positioning, prior to operating, is less than the minimum proscribed in the EBA. In this case – manually enter the maximum of (Scheduled / Actual) Block Time into the EBA Over Ride cell – there is no factoring here, any value you enter over-rides all other positioning considerations. In this case the EBA Over Ride cell shows in orange to indicate it’s over-riding all the other positioning calculations. Note : Occasionally you have to do mental maths to work out the Scheduled or Actual Block time from your roster. If you have a Start and Stop time for this, you can do the maths in your head (remember the two times are Local Time so between MEL and BNE there could be a missing (or extra) hour you have to account for in your formula) – then you can use the following formula in Excel (say the Actual Block is between 14:37 and 16:58) in the cell where you need the result. After you’ve used the formula to get an answer – it’s easiest just to type the answer in over top of the formula. Flights also require more details in order to calculate the correct credit value. This includes tracking both Scheduled and Actual Block Times (Pushback to Park). Note that the Flt Time value that appears on your Sabre roster at publication (or before you fly the trip) is the Scheduled Block Time applicable for the trip. Shortly after you have flown the trip – this time becomes the Actual Block Time you flew – and the Scheduled value is no longer accessible. I therefore strongly recommend taking screenshots of your roster after publication so you can retain the scheduled values. More complicated is the implementation of the Minimum Credit Guarantee. Basically when you head off from Home Base on a series of duties that includes a Flight Duty Pairing where you are operating (not positioning) – you get a minimum credit of 5 hours per day until you complete the Duty Period that signs you off at Home Base. This includes any Duty Types (Simulator, Admin, Ground Training, Open, Standby, Day Off, etc) as long as one of them is a Flight (Operating). 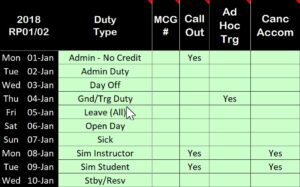 At the end of the duty series – if the 5 hour per day credit exceeds the credit from the Duty Period/Types – you are paid the MCG. I’ve implemented this methodology using the MCG # column to the immediate right of the Duty Type column. Anytime you start a series of flight-related duties (1 or more) where the MCG is applicable (because of a Flight) – place a number in the MCG # cell for each date of the sequence of duty periods. Keep that number identical for subsequent duties until complete the series ends back at Home Base. Use a new number for the next series of duties that includes an FDP. It sounds more complicated than it is … Mostly. Firstly select Flight from the Duty Type list box on the left against the departure date of your flight. Note that technically this is the departure date based on your Crew Base Local Time. Which for evening LAX departures means the day after that shown on your Sabre roster. Now enter the MCG # value. While the specific number actually doesn’t matter (I’ve limited it to 1…9 for now) – I suggest using 1-1-1-1 for your first trip; then 2-2-2-2 for your second trip, etc. Note that when you select Flight the MCG # cell next to that selection will turn yellow to highlight you need an entry there. When you choose a non-flight for the next day (say, Away Day) the cell will not be yellow – but this cell still needs the MCG # since it’s part of a sequence of duties. Next, scroll across and you’ll see the Flight Details area has some yellow areas for entry. Enter the From airport and the To airport, then enter the Scheduled Block time (shown on your Sabre roster as Flight Time at publish). This will give you an initial estimate of the credit hours that will come from this duty. For the moment I have not provided for multiple sectors on the 777 – I’ll do it with the 330 and then decide if the solution should be rolled back. Further to the right, you can see the EBA Credit has your scheduled block time value. Once you’ve operated the flight, look back at your Sabre roster and enter the actual Flight Time into the Actual Block time in the spreadsheet. If Actual was longer than Scheduled – you’ll see the new, larger value in the EBA Credit cell. 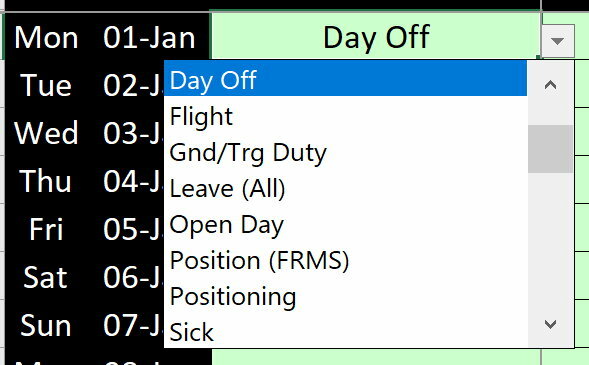 Remember that if you’re called off one or more days off for a trip – enter Yes into the Call Out cell to the immediate right of your Duty Type selection. Finally, once again remember that if you commence a Duty Period with Positioning (or anything else) that goes over midnight Crew Base Local Time of the last day of the RP and into the next RP – the credit (Scheduled/Actual/EBA) goes into the RP in which the Duty Period commenced. The following is an example where the MCG applies – in this case, the shorter BNE/LAX flight times (after Standby), along with an extra day in LAX brings the MCG into play. Since the MCG Accumulation (7 x 5:00) comes to 35:00 while the Sequence of FDP related duties comes to 33:00 – there’s a 2:00 in the MCG Addition column at the end of the MCG sequence, and this 2:00 extra has been added into the EBA (& MCG) column on the far right. The MCG is paid by the spreadsheet against the last day of the sequence – either as the only credit (if the last day has no credit, like an Away Day) or added to any credit on that day – like in this example where the 2:00 is added to the Positioning Credit of 1:10. This sequence is positioning to MEL-BNE for Standby, then heading off on a 5 day trip to LAX (you never know …) then coming back to BNE and positioning BNE-MEL home after arrival. Note in this instance I was called out for this sequence as indicated by the Yes in the Callout column. The MCG # (2) is selected for the entire set of the MCG related days. Because the Positioning and Standby days are associated with the Flight Duty Period sequence – they count towards MCG. The “2” probably means this is the second trip on my roster. Positioning on 28/Jan was 2:00 because that’s the minimum. Although the MCG of 5 hours on the day exceeds this value – MCG applies across the total sequence of duties, so you can’t tell if MCG is going to pay until it’s all over (including Actual vs Schedule for both Positioning and Flights). Standby on 29/Jan has a 5:00 hour credit. The Flights on 30/Jan and 02/Feb are credited based on the highest of (Sked/Actual) Block Time. During the sequence, the highest of the MCG Cumulative Credit or Pairing Cumulative Credit is highlighted (subtle yellow). At the end of the sequence – the MCG accumulation comes to 35:00; the duty related credit 33:00 – so the MCG adds 2:00 hours to the EBA (& MCG) Credit for the series of Flight related duties. Note that while the EBA may not be clear – the Payroll system is coded to look only for an FDP as part of a series of duties; then it looks for the first Duty Period that took you away from Home Base at or before the FDP; and the last Duty Period/DFP that brought you back to Home Base. MCG is applied across the entire series of duties – FDPs and non-FDPs alike. In the example below, I choofed off to Sydney on 02/Jan to teach two days of Ground School. Then I headed off SYD-LAX and came back the next day. On the last day (after arriving into SYD) I positioned home to MEL. The MCG calculation is done across all these duties. In this instance MCG Cumulative Credit is less than Pairing Cumulative Credit. We are near the end now. All that remains in terms of entering your roster is the consideration of carry-out MCG. (b) Includes at least one Flight Duty Period (where you are Operating). This is of course the exact same definition as used with defining a series of Duties for the purposes of MCG. On this basis – for any Flight Pairing that spans two RP’s – the entire credit value for that Flight Pairing (including any applicable MCG Addition) is paid in the RP of the Sign On (Report Time) of the First Duty where you left Home Base. : Enter the series of Duty Types (including at least one Flight) of the Flight Pairing that starts on (at least) the last day of the RP and carries into the next. The MCG # must on or before the last day of the RP and continue into the carry-out period – and not change. : Callout, Ad-Hoc Trg and Cancelled Accommodation are not applicable here – they go into the next RP sheet. : Enter any Positioning as you normally would (25/Feb; 03/Mar). : Enter Flight Details (both Scheduled and Actual) as you normally would (27/Feb; 02/Mar). : For this example, based on the Cumulative MCG (35:00) and the Cumulative Pairing Credit (33:10) – there’s an MCG Addition of 1:50 to be added to the RP total in which the Flight Pairing began – this one (on top of the Flight Pairing credit). So you can see here that this sequence has resulted in 33:10 hours of carry-out Flight Pairing Credit (note that is the credit incurred from days after the end of the RP) and a 01:50 hours MCG Addition – all of which will need to be claimed in this RP rather than the next one. It also means that the sequence of flight duties from 26-Feb through 03-Mar will NOT be paid in the next RP, since the MCG value was paid in the previous RP against these duties. When you use the carry-out MCG feature – if you determine that the Cumulative MCG is the greater value – this means that the duty periods associated with the entire MCG sequence will not contribute towards the credit in the following RP. So when you start the EBA Calculator for the next RP – use the MCG # of CIP (to indicate Carry-In Pairing) and the calculator will ignore these duties for the purposes of credit hours towards overtime. You only need to enter the duties relevant to this RP (not the other elements of the carry in Flight Pairing in the pervious RP. This includes any duty that spanned midnight between the two RP’s – such a duty is not relevant to this RP). : Entering CIP into the MCH # tells the spreadsheet that the EBA Credit for these duties will not contribute towards Overtime for this RP. : If there’s Callout (or Ad Hoc Instructor, Cancelled Accom, etc) – these must be selected, because these will be paid in this RP. : You can enter Positioning and Flight Details for later reference – but they are not used. : You can see that none of the Carry In (Purple) area is credited towards the ongoing Credit Hours for the RP. At the top of the sheet is a small summary of the RP. It includes Credit Hours (Total, RP OT Cutoff, OT Hours, Overtime $ and any Flight Pairing Carryout Hours); Callouts; Ad Hoc Trainer pay; Cancelled Accommodation Pay and a summary of Leave / Min Days Off / Days Off. If the days off entered into the sheet is less than the minimum, this is highlighted. Note that this check is only valid at publication – after that, minimum days off is a function of the FRMS requirements. No, these values are not realistic! As always I would appreciate the feedback, corrections, errors, acclaim, monetary reward and any instances of simple, humble worship and awe of my Excel skills that come my way. Keep me in the loop if you use it, please. To the surprise of many (including me), a provision of the Domestic EBA made its way into the Wide Body EBA of 2017. Specifically – when you are called out off leave to perform a duty – your overtime threshold remains at the level it was at publish time. This is change from the previous Long Haul EBA where your OT threshold was based on the leave you actually had based on the flown/completed roster – so if you worked on your leave, the OT threshold increased proportionally to the number of leave days you worked. This is no longer the case – and makes working on leave more punitive towards the company. Note the leave you have lost by working on your leave is still returned to the bank. I am working on an update to the sheet to correct for this but I have a lot on at the moment so it will be a few days. In the meantime – if you have taken callout from leave it is likely that you have been underpaid – the company is aware of this and working towards re-imbursement. If you find this post valuable and would like to see more – please consider a small donation to my PayPal account.